100% Pure Black soap comes in a convenient tub which enables you to have a product that last longer. The tub provides protection from moisture and air which can dry out the black soap. 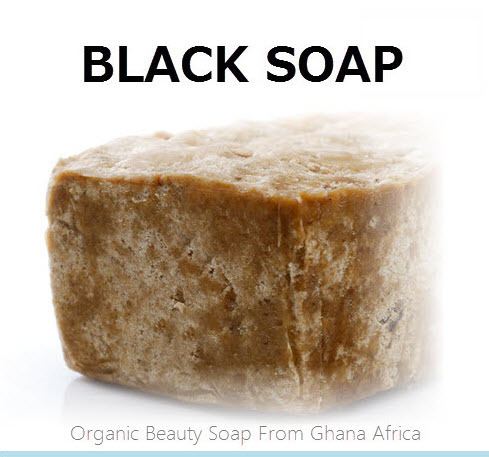 This is one of the purest African Black Soaps available to consumers in North America. Get Authentic Black Soap Here http://mudfarmorganix.com Pure raw and unrefined. Dr Oz talks about the miracle skin benefits of using black soap. Our Black Soap is Made From: Plantain Skins, Cocoa Pods, Shea Butter and Virgin Palm Oil. Pure Authentic Black Soap From Ghana Africa. Available for retail or wholesale Text For Info At: 416 937 6350 Black Soap is very good and its all natural. Use it everyday and see the difference it will make in the tone and complexion of your skin. Don't leave home without your bar of Black Soap from Africa. My recent purchase was above and beyond. Not only is the quality of the product great, the customer service was superb. I can’t thank you enough for your courteous and prompt responses to my questions and concerns. Definitely will be making future purchases! I like this better than the other brand of black soap that I had been using. This is the second brand of black soap that I've tried. I thought I was happy with the other one, but gave this one a shot because of the packaging and because it seemed to be a better deal. I don't think I'll be changing again because this one is great! It has fewer ingredients than the other one and seems to be much less drying to my skin. I know everybody is different, but this one doesn't leave that white stuff around my knuckles and my fingernails when I get out of the shower like the other one did. I'm really happy that I tried it; it was a good decision. We also tried the shea butter and absolutely love that, too! This seller is extremely customer-friendly and a pleasure to work with! Thank you very much! very good soap for anyone that has acne or problem skin, it hydrates my face and body but also helps with my acne!! Ok I'm a teenager and I have always struggled with acne. I have used sooooo many products and not even 1 of them helped me. I had acne all over my cheeks. This product cleared it up in like 3 weeks. I still get 1 or 2 bumps now and again but not as often as before. It also clears up acne scars. I still have some acne scars left though but this product is very good. Oo and it dries out my face so make sure you get a moisturizer like shea butter and it will balance it out for sho.. The absolute best soap to use for acne and problem skin. Rich in softening and protective Shea Butter, this soap's foaming lather gently cleanses the skin helping to preserve its natural moisture balance. It benefits both dry & dehydrated skin. After learning about the chemicals in Dove i have been using the black soap. Takes a bit of portion to rekon with but cleans really well and looks are very pleasing to the eyes. Great product experience..... !!! Nice to have a natural soap. I like it compared to dove and jergains, its better and seems to be evening out my skin tone just after one week of use. Thanks again for the free shipping. Product comes in a plastic tub with see through lid. First time trying black soap to help with problem skin, and seems to be doing much better. Very great product of high quality compared to what i have seen on the market. Great in the tubs you can just take out a piece and use it as needed. It can get mushy and messy so the tubs are a really good idea and i like it very much. I will buy more once this runs out and everyone is loving it. Tried this for the first time and I highly recommend this for those struggling with acne. Combined with a toner and moisturizer this soap completely cleared up my cystic acne that wouldn't go away no matter how many face washes I tried. I've gone through at least four tubs of this stuff and will continue repurchasing forever. Awesome product. Acne Gone and I look Amazing. I have tried many black soaps and this one if by far the finest in quality and i love the fact that there is coconut oil in it. This black soap from mudfarm is working so awesome on my skin. So this soap is absolutely incredible. I'll just start with that. I have used so many OTC scrubs, deep pore cleansers, pore refiners, moisturizers, skin care systems including proactiv and cytology, and to no avail, I still suffered from acne. I'm in my late 20s, I've suffered with pretty moderate acne for a good chunk of my life and have never found anything that worked. Until now. After the first use, I could tell my face was smoother, after a few days, I could tell my existing acne was healing and i wasnt getting any new ones. After a week, my skin was clear. After 2 weeks my face completely smooth, no new breakouts, and I am happier than ever. Not only is my skin clear, by my confidence is boosted. I work in sales so I am face to face with people all day, i finally feel like the first time in my life, people aren't just staring at my breakouts. I will recommend this soap to anyone that can relate. This soap is AWESOME! I will stick to this brand and thanks for the free shipping ,my ordered arrived in 4 days. I can't believe how well this soap has worked for my skin and the overall versatility of this product. A friend give me a piece to try and instantly noticed a difference in the quality of my skin and hair. I won't use anything else and i have told all my family members about it. Black soap is made with rare tropical honeys that are known for softening the skin and creating a smooth surface. Black soap is also a natural source of vitamins A & E and iron. This helps to strengthen the skin and hair. Black soap contains a high amount of glycerin, which absorbs moisture from the air and literally deposits it into the skin, making the skin soft and supple. For centuries, Ghanaians and Nigerians have used black soap to help relieve acne, oily skin, clear blemishes and various other skin issues. Many swear by it for skin irritations and conditions such as eczema and psoriasis. Women in Africa will use black soap during pregnancy and afterwards to keep them from getting stretch marks and to protect them from dry skin that is often accompanied by pregnancy. Black soap can also be used as a hair shampoo. The shea butter in the soap softens the hair, while the vitamins give it strength. Men can use black soap in shaving. The high shea butter content leaves the skin smooth and protected. African black soap is unique in that it contains no preservatives, color enhancers, or fragrances. African black soap creates a soft lather without the animal fat additives that are commonly used in soaps made in the US. My sisters are going through a health craze right now and only buy food, soaps, shampoos, etc. that are completely natural and organic. While shopping with one of them, she recommended this soap to me. I saw that it was for troubled/acne prone skin. I suffer from very, very bad Keratosis Pilaris (*chicken skin*) on my arms (from my wrist all the way up to my shoulder, redness and bumpiness), so I decided to try it out. The results are absolutely amazing and I''ve had my KP kind of under control before buying this product. The bumps were mostly gone, but the redness remained. With this soap, I''ve found that it reduces the redness a bit, and my skin is baby soft! 95% of the bumps are gone! I also use the Organic Coconut Oil after my shower for extra moisture. Both are excellent products that I highly recommend! Try it for yourself and see if it works. This soap is very nice and the quality is superb and last long. I use it on my face, hair and entire body. Its less harsher than other black soap and does not have black peices of ash in it which i don't like. Great product for the price and you can't beat free shipping. Found this soap online from mudfarm and I must say, my skin has cleared up. It didn't happen right away, but I was getting those types of pimples that just explode onto your mirror whenever you squeeze them. I would have multiple ones at a time. Now, I have none of those and any blemishes that do appear are very mild. I have not yet noticed any difference in my acne scarring but I truly do feel that using this soap has a better chance of diminishing their appearance than any facial cleanser on the market that is loaded with chemicals, etc, and nothing truly good for your skin. Follow up with Shea Butter and see if your skin improves. Drink lots of water too and stay greened up. I am very happy with my purchase. It smells good and it has cleared up much of my bacne (back acne). I have only made one purchase but I plan on buying in bulk when I can. *Update: I have finished the initial bar I purchased and I can say that my back acne is finally clear, and I stopped breaking out when I shave. I will only buy from Mudfarm Organic because the bars are twice the size of the ones you will find at Walmart or Target and it has fewer ingredients than the other brands around. Really great stuff i recently was introduced to black soap and i live in Toronto, so its great to have a company in Toronto that has a retail shop for black soap and african shea butter. I went natural and are trying to eat healthy as well and its good to use chemical free products from mudfarm organix to give you nice skin. Click the button below to add the African Black Soap 100% Authentic to your wish list.